We first started playing 40 years ago as contract bridge was played in our workplaces at lunch time. We learnt at the CWA! Many Adelaide readers will remember the teacher, Kath George. Then seven years ago, Julia started a small, not for profit, community club auspiced by the Adelaide City Council. Council assists with purchases like tables, teaching materials, bidding boxes and boards. Over the years to attract and keep new players we found we needed to provide lessons. We were unable, on the small gold coin contribution players make, to afford a tutor and so we decided to do it ourselves. 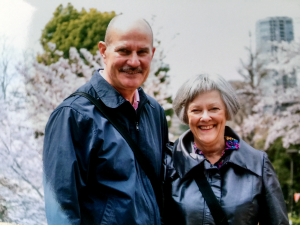 Bruce’s retirement as a teacher coincided with the beginning of the ABF accredited program for teachers and 12 months ago we began offering a course for beginners, advertising through the local newsletter. With more confidence and with a great program and teaching resources from Joan Butts, we now offer intermediate lessons. We have really enjoyed seeing the rapid progress of our players through the beginner stages to intermediate, and their support and enthusiasm for the club. It is also very rewarding to be able to offer a community based activity that is suitable for a wide range of ages and physical abilities. For ourselves as players, improving our communication and bridge skills, even sticking together, is a constant challenge. We are assisted in our own learning and play by the great team at Adelaide Bridge Centre. Probably most readers of this article don’t realise we aren’t the best players and we aren’t the best teachers. We joke that we could now run a cruise course in a tinny on the Torrens. We have been successful because the program, teaching resources, and support from Joan Butts, has been fantastic.